I just got back from grocery shopping today. I spent $140 for groceries for two people. While that’s a little higher than normal, the one thing different about this trip to the grocery store is that I returned with not a single meat product. This after finally being convinced from two different documentaries Forks Over Knives and Chow Down that avoiding meat can go a long way in improving your overall health. 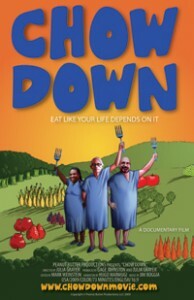 The Chow Down documentary covers some of the same ground as the Forks Over Knives film, even including some of the same experts. But this film delves into how special interest groups from agriculture to pharmaceuticals are partly responsible for many of the health problems we experience today. This is a timely message. Only last week Michelle Obama presented the newest replacement to the food pyramid – the plate. I won’t spend any time on the merits or lack thereof for this new government recommendation except to say that they no longer mention meat but instead say protein, and it also now emphasizes dairy. So after two million dollars of research the fact remains that the American people are still not getting the facts. Can you imagine the uproar had Michelle come out against dairy? You can learn more about how the government is influenced by special interests in this fine documentary. One of the most shocking revelations was how the researchers behind the original food pyramid saw their efforts to tell the truth about diet thwarted by special interest groups. So here we are some thirty years later, facing a long list of health problems, and nothing has changed despite a wealth of scientific evidence that our current diet of animal fat and excess dairy products is harmful to our health. Now I’m not promoting a 100% vegan diet. Though the evidence seems to indicate that that’s what I should do. The documentary doesn’t shy away from some of the difficulties with convincing people to change their diet. Switching to a plant based diet requires some sacrifices. There is a convenience factor involved. There is a time factor involved. And there is a taste factor involved. If I’m hungry, am I going to spend thirty minutes whipping up a healthy plant based meal, or am I going to go through the drive through and have instant gratification. If you really want to know what you should be eating, watch this documentary and the other’s including Food, Inc. and Forks Over Knives. You can visit the film’s official website at ChowDownMovie.com Better yet. Here’s a first for this blog. Kick back in your chair and watch Chow Down right now.